Habitat garden design at the Bed and Breakfast on Glen Lake. This past week one of the most delightful projects fell into my lap: a new habitat garden design at a bed and breakfast on Glen Lake in Lake George, NY. The property is owned by some of the lovliest people: educators and ecology enthusiasts. The bed and breakfast is an air B&B, in the European tradition, it is minutes from Lake George village and only twice that to Saratoga and the race track. Yet at the private lakeside residence, it is quiet, the habitat gardens are surrounded on one quarter by lakefront and three quarters by wooded edge. Heavenly. The past owners who installed the landscaping onsite had very plebian taste in plants; it was hosta, arborvitae, invasive Burning Bush Euonymus and other common evergreen shrubs as far as the eye could see. Adjacent to the screened in porch, we ripped out some low growing evergreen shrubs (that were unexpectedly easy to remove) and added a dual tiered design, composed entirely of habitat friendly native species plants. 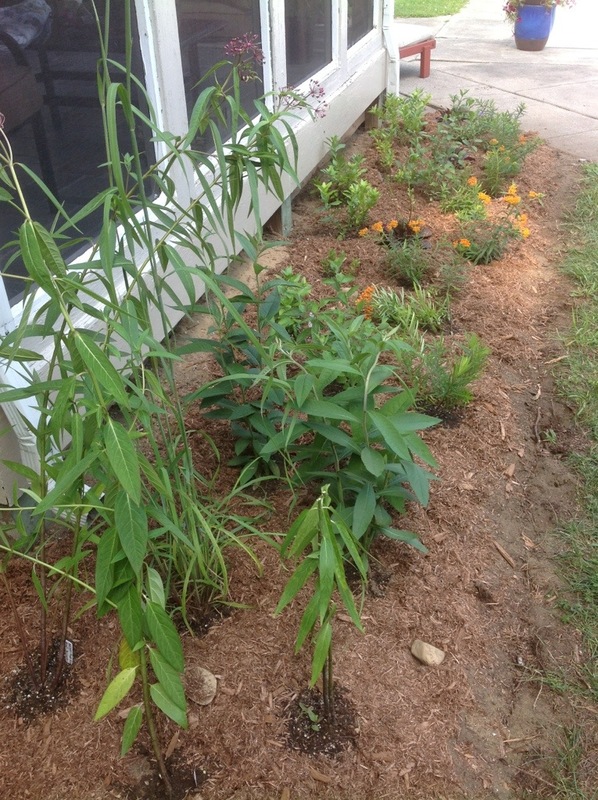 The rain spout from the gutter empties at the left side of the porch, and so we chose plants that are rain garden tolerant- which means they are okay in standing water or dry, almost drought conditions. The plants at this end were Andropogon gerardii, Big Blue Stem Grass, Asclepias incarnata, Swamp Milkweed and Vernonia glauca, New York Ironweed. 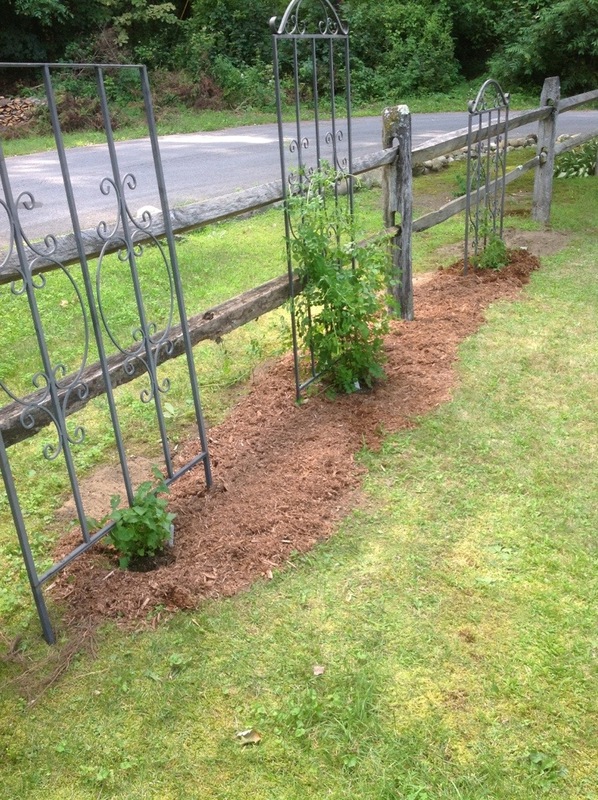 The extension of this bed contains sandy, dry soil in full sun so we planted Asclepias tuberosa, Orange butterflyweed, Amsonia tabernaemontana, Bluestar, Verbena stricta, Hoary Verbena and Salvia lyrata, native Salvia. 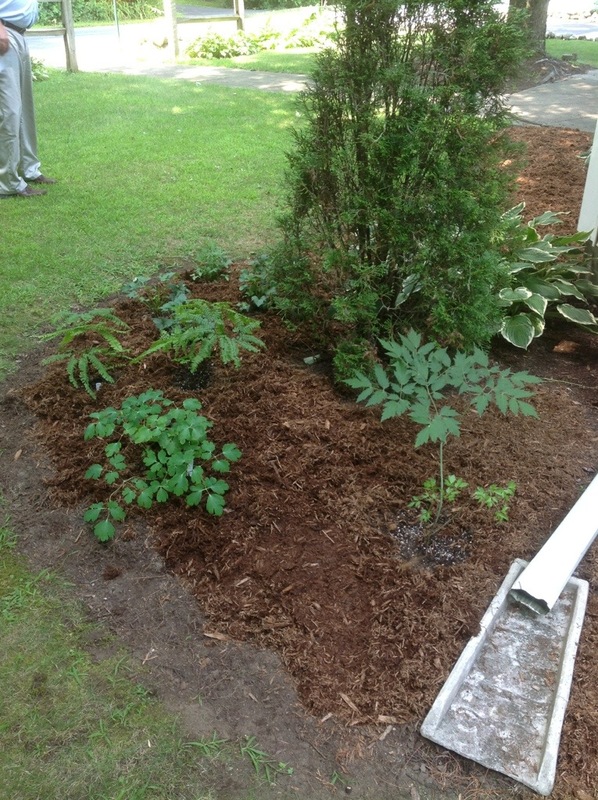 Another bed was rich with non-natives like Daylilies and toss-away Iris. 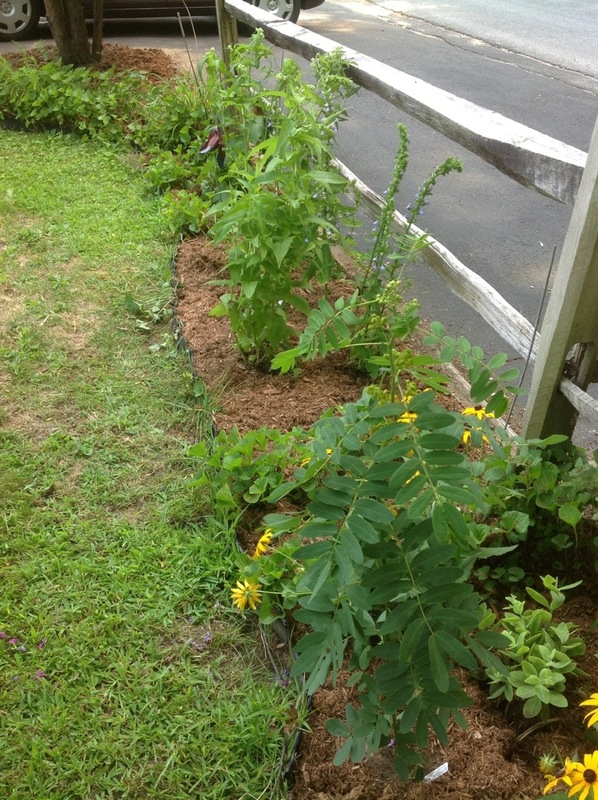 It was an easy trick to spruce this corner up by displacing the weedy daylily with native, endangered Senna marilandica shrub. 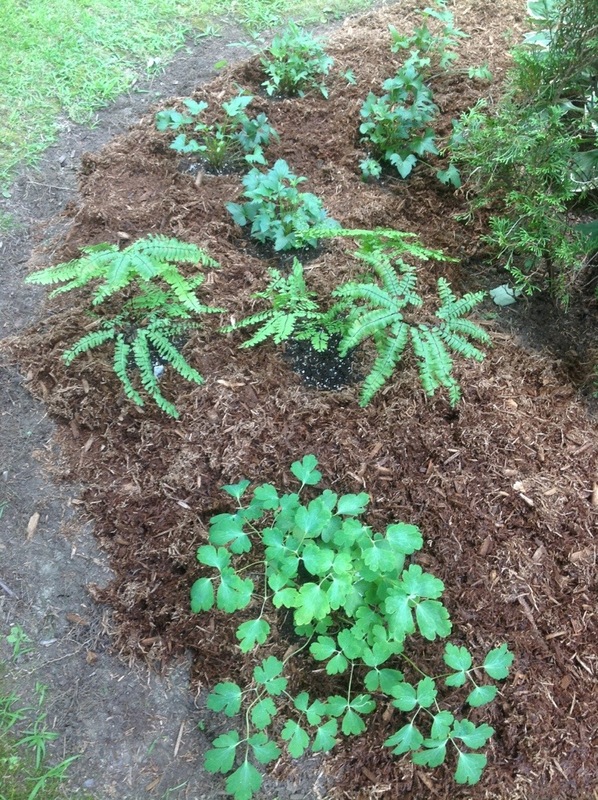 In the same bed we added Lobelia siphilitica, Blue Lobelia, Eupatorium perfoliatum, Boneset, and Rubus odoratus, native flowering Raspberry shrub. Along the sunny fenceline, Hosta had become embedded like cement. Digging it out was a herculian effort, and the rewards will be exponential and long lasting. 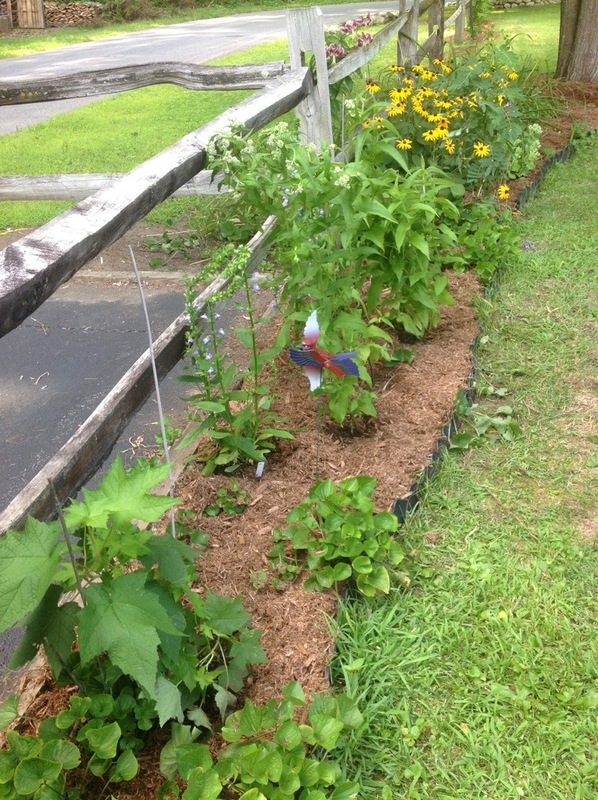 All the ecologically zero value hosta has been replaced with high habitat value native vines: Campsis radicans, yellow Trumpet vine- a hummingbird favorite, Clematis virginiana, Virgin’s Bower or native Clematis and Mikhania scandens, Climbing hempvine or Boneset vine. 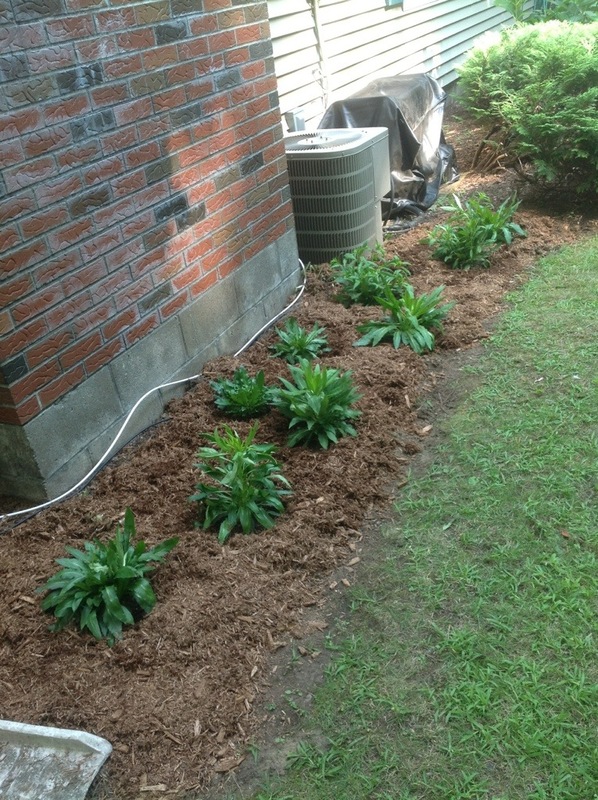 Incredibly there was more hosta edging the house, besides all the hosta forming a perimeter around the property. 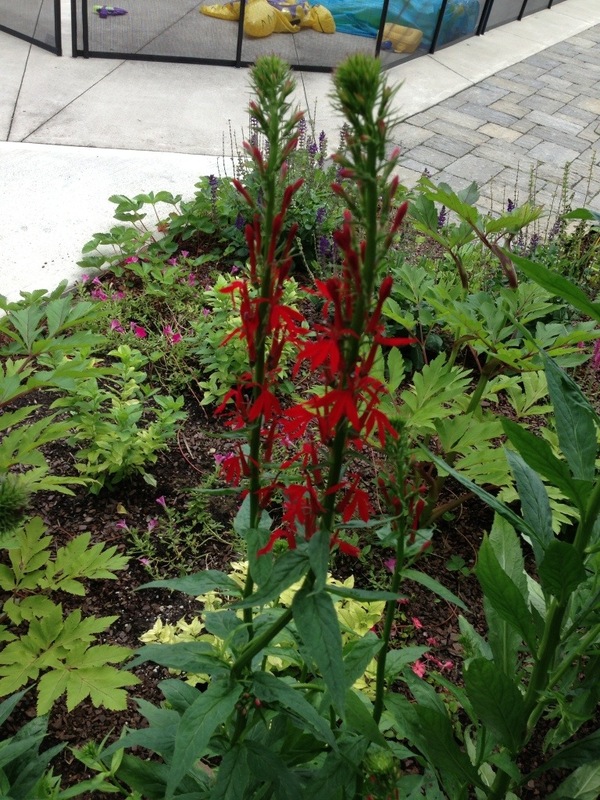 The local wildlife is sure to rejoice as this Lobelia cardinalis, Cardinal Flower establishes itself. Cardinal Flower is tough as nails, shade or sun tolerant, wet or dry soils are fine, hummingbirds and butterflies adore it, and it’s longlasting, spectacular red bloom display is second to none. As I planted these 9 individual Cardinal Lobelia plants, a Dragonfly came and hung out for a couple moments, with curiousity or excitement- it was hard to tell. All these native plants will certainly do wonders to increase the carrying capacity of the local pollinator and other insect community, which in turn will be a panacea to the local bird population, both the migratory species and the overwintering varieties. 2/3 of all bird species in our country are in a population strain, and so a habitat renovation project like this, in such a productive ecosystem, is actually a reason to get excited about. The Glen Lake Ecosystem is famous for its Osprey sanctuary. The north side of the house is brimming with shade garden potential; we got the process started with a mix of Viola triloba, Wood Violet (endangered Fritillary butterfly larval host plant), Adiantum pedatum, Maidenhair Fern, Aquilega canandensis, Wild Columbine (another hummingbird favorite), and Cimicifuga racemosa, Black Cohosh. The habitat garden design at the bed and breakfast on Glen Lake is a renovation that’s a strong vote for the strength of this community’s ecosystem. 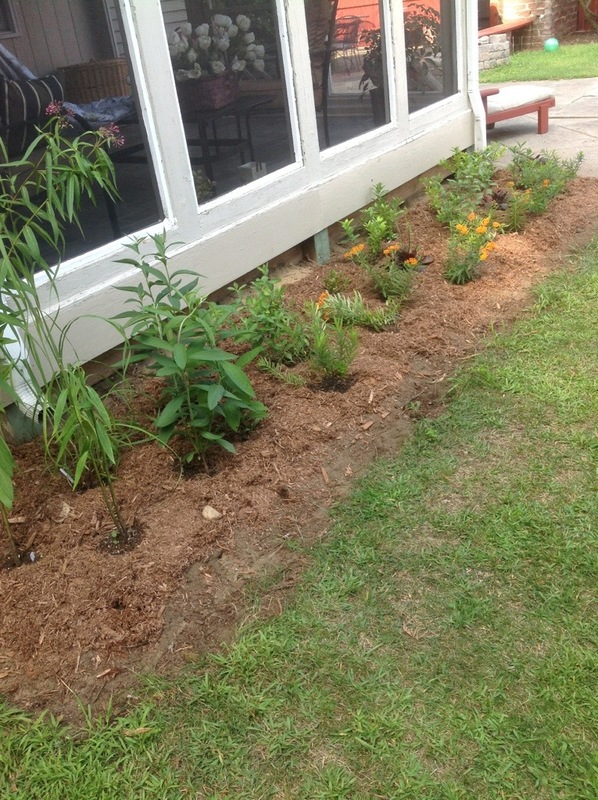 The project warms my heart and I wait eagerly to watch the establishment of the native plants.